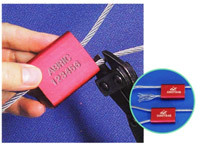 Alulock, classed as a barrier seal, is a variable length cable security seal, providing high security, through its easy to use, one way locking mechanism and cable design. This seal conforms to ISO 17712 (HS) specs at 3.5mm width and is therefore CTPAT compliant. Anodised aluminium body with steel aircraft cable. Once cut, the cable will splay, increasing security. Can be used to secure imported/exported goods. Range of colours allow colour coded security and efficiency. 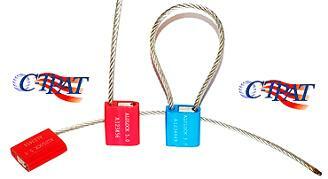 Cable widths of 1.5mm, 2.5mm, 3.5mm - Cable length 300mm. Body - Anodised Aluminium, Cable - Non preformed galvanized steel aircraft cable. Custom printing available with name/logo and number. Standard colours - Black, Blue, Bronze, Red. Contact us for other colours. -40˚C to 120˚C (-40˚F to 240˚F).